On Sundays William Dun conducted a Protestant service at Duninald just across the river from Tocal, and Government regulations forced convicts who lived nearby to attend. In 1827 Father Therry, a Catholic priest at Newcastle, complained to Tocal's owner and local magistrate James Webber that Catholic convicts at Paterson had been flogged for refusing to attend Church of England worship. Webber replied by letter (see below) that he had discouraged such floggings as far as possible. 'It was Sunday, but nobody here keeps the day as anything more than a holiday. Men wash their shirts, and grind their week's wheat, and visit, where the huts are not too far apart.' [A Harris, Settlers and Convicts, 1847]. Visiting neighbouring farms sometimes involved drinking spirits bought from the unlicensed grog shops which invariably sprang up around the larger estates. Some earned money on Sundays by making sheep hurdles, repairing ploughs and harness, carving bullock yokes or breaking in bullocks. 'Patersons Plains, October 27th 1827. 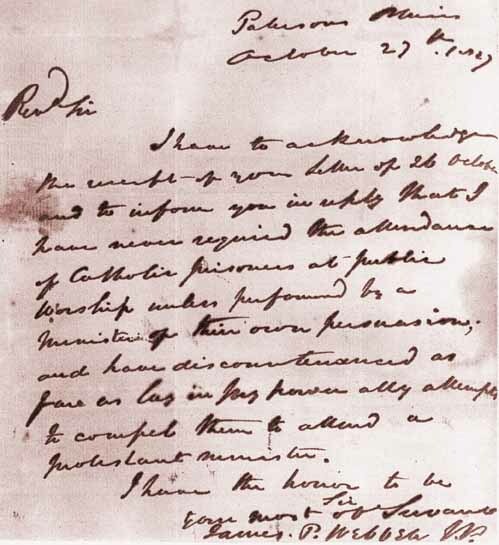 I have to acknowledge the receipt of your letter of 26 October and to inform you in reply that I have never required the attendance of Catholic prisoners at public worship unless performed by a Minister of their own persuasion, and have discountenanced as far as lay in my power any attempts to compel them to attend a protestant minister.